In my job as a designer for animated films, I am always in the studio, but for my own personal work, I gravitated towards the plein air approach, partially as a means of escape from the studio. In the 12 years or so that I've been working outdoors in pastel, these are the first studio pieces I have attempted for my personal work. 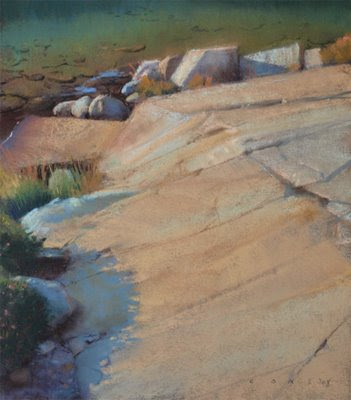 Recently I found myself with some time to focus on my own art, so over about a 2 week period, I took some of my Sierra pastels and worked them up into larger pieces. Large is relative, as these pieces are 14 x 16". Too large for me to take out in the field with my current setup, but perhaps still considered small by many artists. Scale aside, what I found valuable about this process was the ability to contemplate, correct, and explore 'happy accidents', following many of the valuable paths and processes that enrich our experience and work as artists. When working outdoors, there are all sorts of constraints and conditions operating that are part and parcel of that experience. The dynamics of light and color are constantly and relentlessly shifting, the weather may be bearing down unpleasantly, and there's a practical limit to the size one can work in. These issues are not present in the studio. What's missing there, of course, is the contemplative, focussed, witness of nature, through one's own eyes, the sense memory of place, light, and color, as well as the physical result of that, laid down in some form by the artist. Each process has it's own unique benefits, and combining them is a natural evolution, I am realizing. The fact that it has taken me 12 years to figure this one out, doesn't really bother me at all. It just gives me something to look forward to on rainy days. 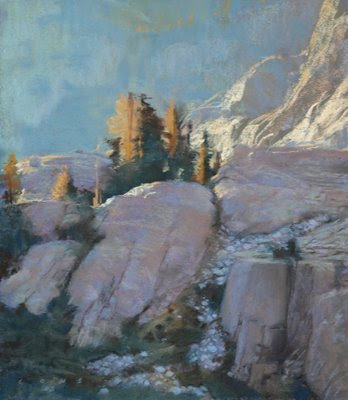 I was partially inspired by an interesting essay written by Jean Stern in the spring 2008 California Art Club newsletter, provocatively entitled, "Plein Air Painting: Where Did We Go Wrong? I felt Jean was challenging artists like myself, who only paint outdoors, and have ignored the studio as a resource for the further development of what is found in nature. He seemed to be implying that we were just eating the cookie dough, instead of baking cookies! 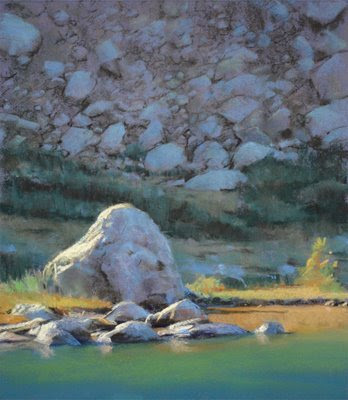 Also, Sharon Calahan, a coworker, and talented fellow artist, recently exhibited some large oils at a Napa Valley show, based on her plein air work, that impressed me. 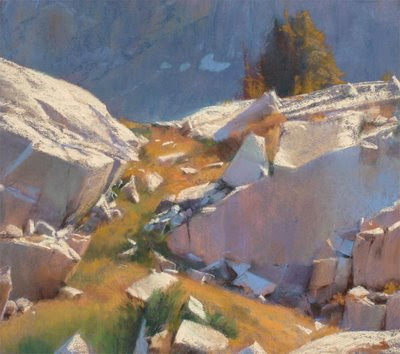 The father of all this for me, has to be Clyde Aspevig, whose catalog 'Field Studies' was responsible for getting me up into the Sierras to paint in the first place. That catalog is hard to come by, but fortunately, most of the paintings in it are also reproduced in a wonderful book on Aspevig's work, entitled 'Elemental Solitude', which can be ordered from his own website.